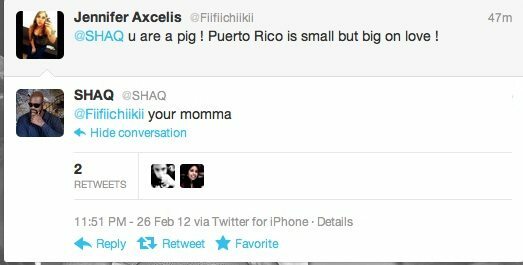 A report out of La Nueva 94 in Puerto Rico states that ex-NBA star and TNT personality Shaquille O'Neal had some choice words for the island, during NBA All-Star Game festivities this weekend in Orlando. “No necesito nuevos fanáticos, Yo tengo ya suficiente dinero en el banco…y de hecho, qué rayos es Puerto Rico… si solo es un simple lugar que ocupa poco más de ¼ de pulgada en el mapa. No me interesan y no me afectan”. As of this morning, El Despelote from La Nueva 94 is standing by its story, although its original post lacks content and details. The site for Tiro al Blanco, TabDeportes (which is ad-sponsored and annoying to navigate), has a more detailed report. 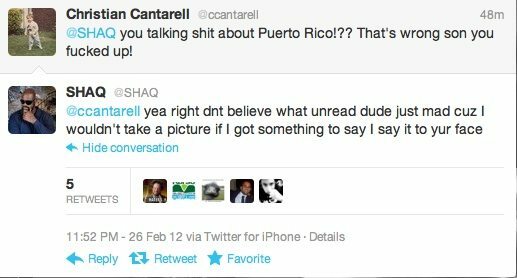 Apparently, according to TAB, Pérez spotted O'Neal at the Amway Center and asked a bodyguard to see if Pérez could take a photo of O'Neal for Shaq's fans in Puerto Rico. 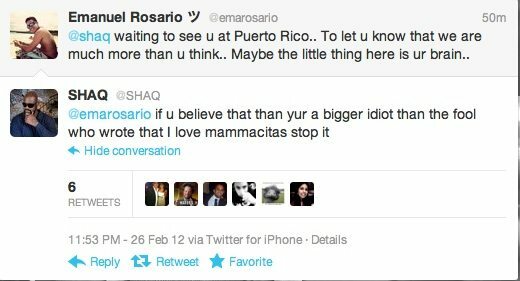 The bodyguard was friendly to Pérez, but according to the TAB report, Shaq was not. 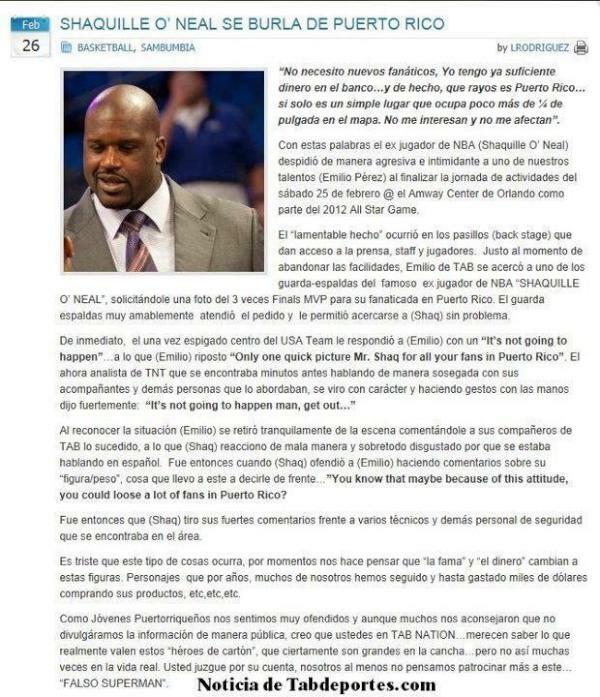 O'Neal's latest tweets confirm that an incident did occur with Pérez, whom Shaq described as a "fat obnoxious writer." O'Neal has denied pretty emphatically that Pérez's story is accurate. After facing countless replies about the story on Twitter, O'Neal did quick video, where he told people to not believe everything they read and said, "Mamita linda, dame besos" (Sweet honey, give me kisses) in Spanish. The TabDeportes.com site no longer contains annoying ad clicks. They updated the page around 2pm EST today. 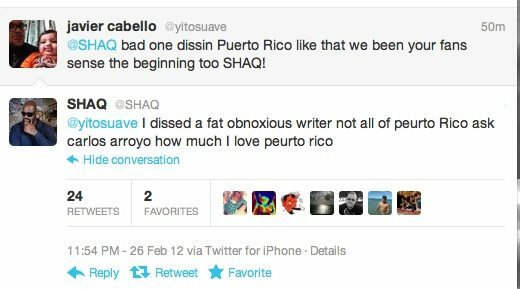 Also, @HectorCruzESPN tweeted out the original story last night around 1 am EST, saying in Spanish that "we deplore everything that happened between Shaquille O'Neal and the @TABPR sports page from Puerto Rico." Since then, the tweet no longer appears on Cruz's stream.